Join the Multicultural Center and International Student Affairs (MCISA) in welcoming our new class of international student to St. Louis from all around the world! Their orientation begins Friday, Aug. 12. To extend our warm welcome, please familiarize yourselves with the schedule of events and resources available to help new students when they first arrive. 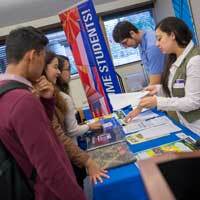 International students are already arriving and navigating campus resources, so please use these resources below to answer any questions about directions or locations of programs. Direct students to locations they may be unfamiliar with to help them find their way. Immigration Check-in during orientation from 11:15 a.m. - 12:30 p.m.
Orientation includes a Student Resource Fair for new students to view and print their student class schedules, open bank accounts, set up mobile phone services, learn more about billing, on campus jobs, campus involvement, and much more. Students receive an email invitation to join Before You Board and must first be enrolled and activate their Connections account to begin. Students arriving for the first time in St. Louis may request free airport pickup service with advance notice. We confirm with students via email regarding arrival procedures and how to find us at the airport. The MCISA office is located at 536 Garden (next to the University Bookstore). We are open from 8:30 am to 4:30 pm Monday through Friday. Help us welcome our new class of Global Gorloks!